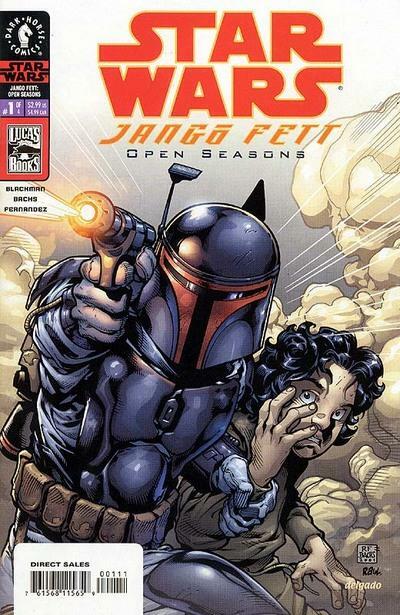 After the first two comic books featuring Jango Fett were released in early 2002 prior to the release of Star Wars, Episode II: Attack of the Clones, we got a sense of who Jango Fett was even before the movie (see previous posts: 1st | 2nd). However, following the movie, Star Wars then came out with a third comic book featuring Jango Fett. Now that we know he is the archetype for the clones, this book asks the question: how did he merit that position? There are four sections to the book and each features a different story from his life. The first of which shows him as a boy with his family, when Viszla, a barbaric leader of Death Watch comes looking for the leader of the Mandalorians, Jaster Mereel, who is in the vicinity. The family, seemingly knowing nothing of Mereel’s whereabouts, all get killed, save for Jango, who is able to escape, once Mereel and his men engage Viszla. Eventually, Jango and Mereel’s men are able to get off of the planet. 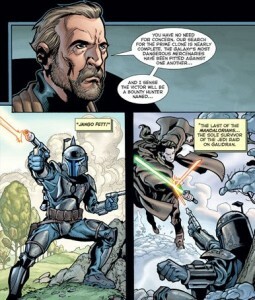 The second segment shows Tyranus interrogating a Mandalorian named Silas about Jango Fett and he tells him of a time when he saved Fett’s life. We now see Jango Fett as a young man, rising through the ranks of the Mandalorians. They go out to do a retrieval job to rescue some people, which turns out to be entirely set-up by Viszla, who’s still alive, who ambush them. Eventually, Jango helps lead the charge, along with Mereel, although the latter gets abandoned at some point by a potential successor and is killed by Viszla. Once the conflict nears its end, Jango is named as the new leader. 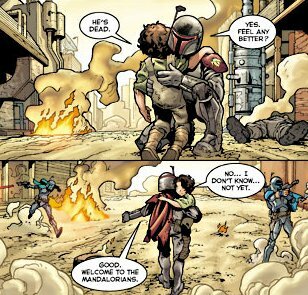 The third vignette shows Jango Fett following a mission that he and other Mandalorians had completed on Galidraan only two years earlier and went to collect his payment, but Viszla was there, waiting to kill him. 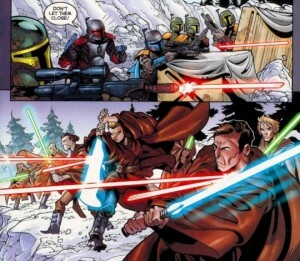 Fett was able to escape, yet Viszla had arranged for the Jedi to come and to fight them on false accusations. Fett was able to kill half of those sent, which is really incredible – killing all of those Jedi! However, he lost the rest of his comrades and he became a slave. The final vignette shows how he escaped from slavery by chance, then got his armor back and went after Viszla. He is eventually able to kill him after a great deal of fighting. At the end, we return to the dialogue and Fett agrees to Lord Tyranus with one condition: there is a clone for him who is entirely unaltered. They both agree that the clones should have the ability to wipe out the Jedi. He is an incredible warrior – as Lord Tyranus says at the outset, “He’s the perfect soldier in every way.” This is greatly illustrated by his ability to kill multiple Jedi! 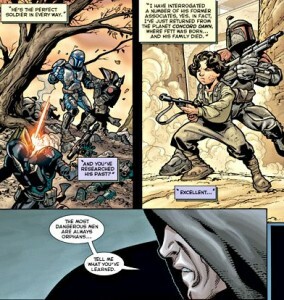 Perhaps this was largely due to his upbringing amongst the Mandalorians and being trained for such combat.